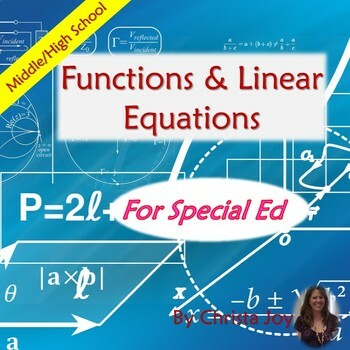 This unit on function families and linear equations contains 254 pages of material specifically designed for students with special learning needs, especially autism who are in middle and high school. 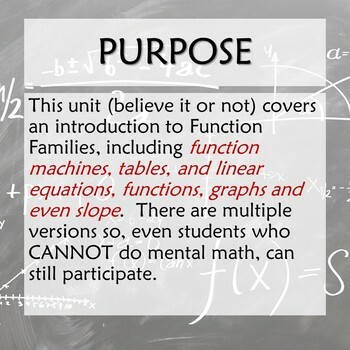 This unit addresses some of the main concepts when it comes to function families like: function machines, function tables, function rules, linear functions, linear function graphs, relationships between variables and even slope in simplified but rigorous way for students with diverse learning needs to make meaningful and authentic connections to the material. There are MANY opportunities for students to engage in repeated information on these very abstract and challenging concepts. This repetition helps students make connections to these concepts using a lot of real-life examples. 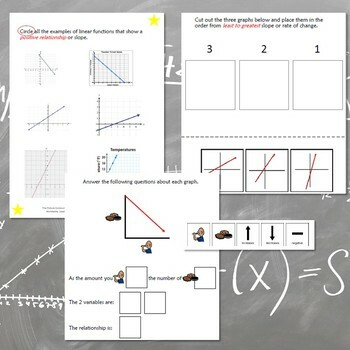 In addition, many of the activities and assessments include more than one version, suggestions for differentiation and options for presentation. So, even if you have a student who CANNOT do skip counting or even simple mental math, he/she WILL be successful with this content and be able to do much of it independently. ✩✩✩ Thanks to a suggestion from a buyer, I am now going to be including a detailed lesson plans with lots of suggested activities you can do with the included materials. If you find this helpful, be sure to let me know in the feedback. I may go back and add this to many of my other units. See the preview for a more detailed look at the contents. Most activities (not book) are in color and BW. Much of what I have learned about curriculum development is incorporated in these units. For example, do not be afraid of repetition. It is critical that students with significant disabilities get to experience material over several days to be able to fully assimilate what is being taught. Also, adding visual supports to your printables and class activities helps students be able to pay more attention to the content you are presenting rather than the mechanics of what is expected. Finally, ask questions. Good questions!! Regardless of the material, if we can ask students good questions it will push them to think more deeply than before. ♥As always please take a moment to leave feedback or post any questions you may have. Remember, you will gain credit toward future purchase on tpt as you leave more and more feedback!! ♥I am currently developing more units, and any feedback I get helps me make improvements in the future. Plus, it just means a lot to me.